Scott is so fashion forward! Said no one ever. LOL! So back when we were dating, 8 or so years ago, Scott and I went to an awards banquet together and his choice in outfit caused me to nickname him “Mottley Scottley.” I’m not quite sure if it was the mismatched colored striped tie and clashing mismatched colored striped shirt, or his murple pants that produced this moniker. And no, that wasn’t a typo. I said murple. Murple is a mystery color – is it purple? green? brown? blue? Who knows! What I do know however, is that it is 1) unlike any hue on the color wheel, 2) exists nowhere in nature, and 3) is very ugly. Knowing Scott, they were on sale 95% off Kohl’s (i.e. they had to basically GIVE them away). Anyhow, when I picked him up for the event, while I was dismayed at his choice in attire, I was also very excited to see what our friends would say when they saw him. Well, it definitely was Scott’s lucky day as the gay guy in the silk leopard print button down stole the show and no one even noticed Scott’s ridiculous motley ensemble. Anyhow, the reason I even bring this is up is because… we have a Daddy Daycare Alert! You know, it’s one thing to dress yourself like a hobo, but it’s another to do it to a poor defenseless little baby. If only she had a button to wear that said, “Don’t Judge Me. 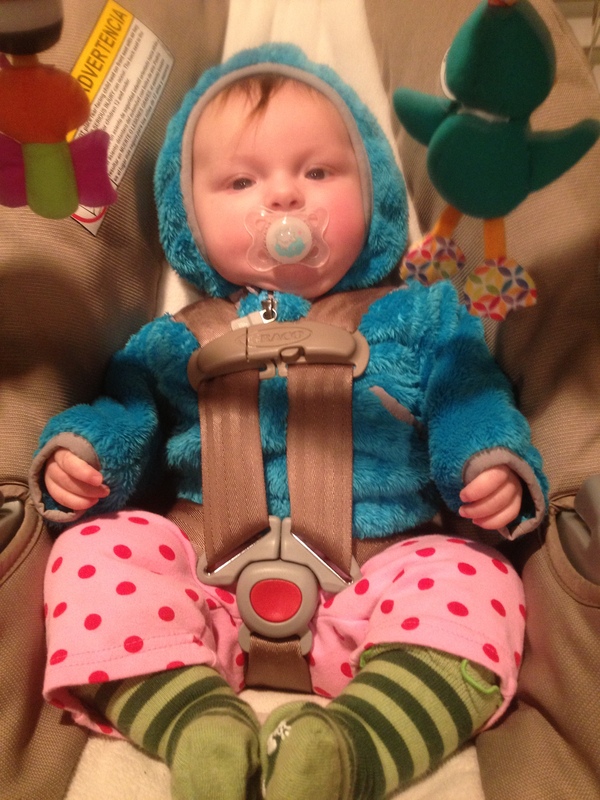 My Daddy dressed me today.” Could we get any more colors and patterns on this outfit?!? LMAO! Seriously too cute though! My Daddy dressed me today! Previous Post 4 Months and Mommy Daycare! All good colors in the rainbow, adorable little gypsy look. He is going to do a great job teaching her all her colors! I was thinking “that’s not bad, pink and turquoise”…then I scrolled down to the socks….hahahaha!